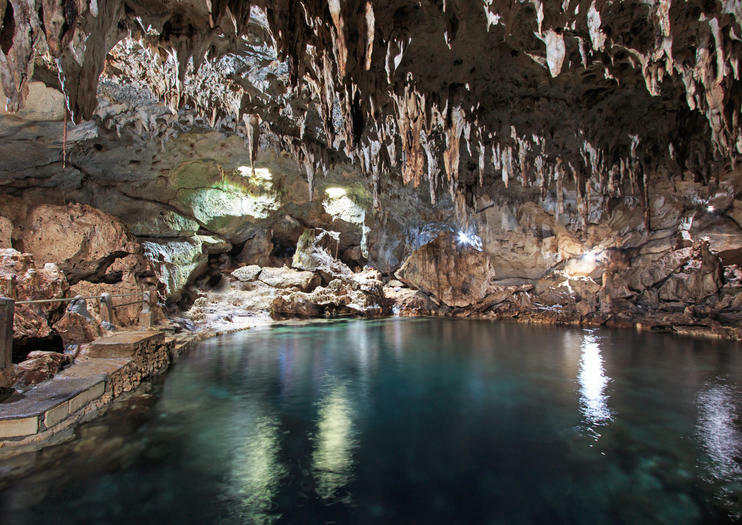 Hinagdanan Cave can be found on Panglao Island in the Philippines’ Bohol Province. Made from limestone, Hinagdanan Cave is naturally lit by sunlight filtering in through holes in its rocky ceiling, which in turn creates some interesting lighting effects. surrounding an underground lagoon, which is warm enough to swim in (although costs extra). The cave is also a place for nesting swallows, which sweep into the cave and sleep in the tiny holes in the ceiling. Hinagdanan Cave has become a popular attraction since its accidental discovery by the land’s owner some years ago, and there is now a firm holding of souvenir shops and stalls that need to be navigated before visitors can reach the cave’s entrance. The Hinagdanan Cave is located on Panglao Island, a few miles from Alona Beach. It can be easily reached via motorbike, bicycle, or via an organized tour. The floor of the cave is slippery so practical footwear is advised, (although there are rope railings to hold onto). Discover the beautiful island of Panglao on a half-day tour from Bohol Island. Visit the island’s key landmarks such as the Our Lady of Assumption Church, Hinagdanan Cave, and St. Augustine’s Church with all entrance fees included. After a day of sightseeing, relax on the beautiful Alona Beach and admire the picturesque scenery of Panglao before heading back to your Bohol Island hotel.